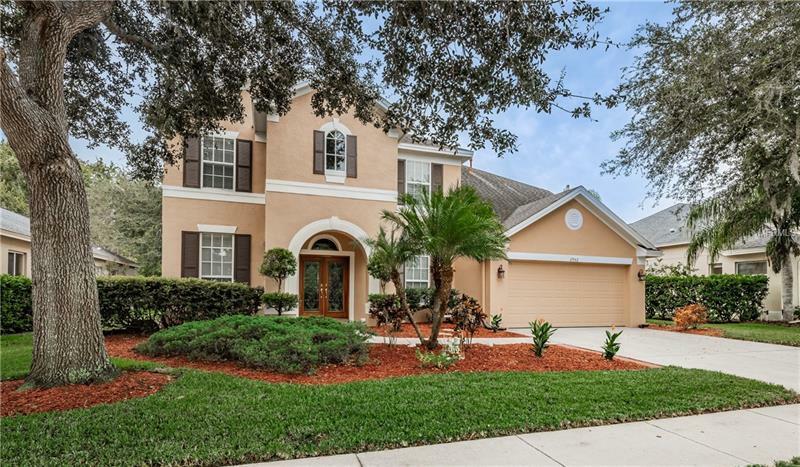 Gorgeous 4 BR/3.5 bath, pool home with pond and conservation views in the desirable Northfield subdivision of the exceptional Lansbrook community. Enter through the Brazilian oak and leaded glass double doors to a home rich with detail and boasting a functional floor plan that is truly designed for entertaining and relaxing with the family. Passed the formal living room and dining room you will enter the hub of the home with its spacious kitchen featuring ample storage and work space, granite counters, stainless steel appliances, pantry, breakfast bar, and in-kitchen eating area. All overlooking the open family room with its 22-foot ceiling and wall of windows. Conveniently located off the kitchen is a half bath and door to the relaxing, brick paver lanai & pool area. The amazing 1st-floor master bedroom features a large walk-in closet and en-suite bath w/ dual sink vanity, water closet, soaking tub, and glass shower. Upstairs you will find 3 nice-sized bedrooms each with a walk-in closet. Also on the second floor is a large loft available for relaxing, studying, or game night. 2 full baths complete the upstairs. This home has all the amenities including new wood floors, 2 seer 15 A/C (2015), gas water heater, gas range, salt water pool system w/ variable speed pool pump and new gas pool heater, oversized 2 car garage. Excellent location w/ top rated East Lake H.S. just steps away. Lansbrook offers 2 parks with playgrounds, basketball courts, soccer fields, walking/biking trails and access to Lake Tarpon.